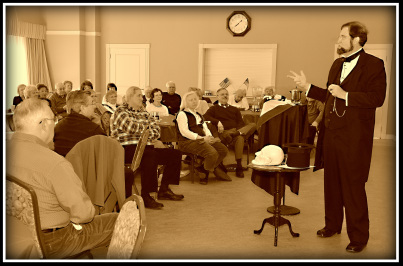 Robert is a nationally recognized Lincoln presenter and historian with over 10 years of experience and has given hundreds of appealing and thought-provoking presentations. “We so enjoyed the humor and knowledge that you so easily share. It is an absolute pleasure and honor to listen and learn from you. When I watch and listen to you, I see all those things Mr. Reagan spoke about. 1. Lifetime Member of Association of Lincoln Presenters & past Vice President. and Museum in Springfield, IL.